A dozen LNER loco’s line up for a fantastic ‘Fab Four’ event at Barrow Hill. Once the pride of the London & North Eastern Railway, a round dozen of their finest preserved locos are rubbing shoulders at Britain’s only working roundhouse from April 13-15 in what is the biggest gathering of LNER locos since BR days. A VIP day on April 12 to launch the event to the rail industry and media, culminated with a Premier league line-up in glorious sunshine of five of the LNER’s finest locos including a pair of A4 Pacific’s, No. 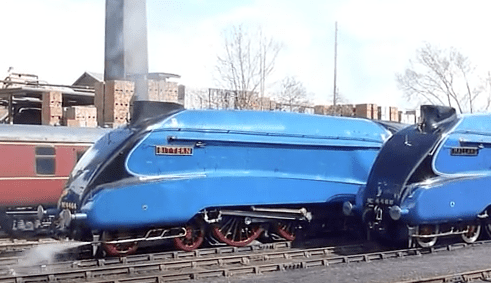 4464 Bittern and 4468 Mallard, A2 No. 60532 Blue Peter, A1 No. 60163 Tornado and V2 No. 4771 Green Arrow. A major event in the preservation calendar, there is a full supporting cast of locos that includes GNR Atlantic C1 4-4-2 No. 251, GCR 4-4-0 No. 506 Butler-Henderson, N2 0-6-2T No. 1744, J17 0-6-0 No. 8217, J72 0-6-0T No. 69023 Joem, NER H class 0-4-0T No. 1310, J94 0-6-0ST No. 68030, ‘Yankee’ 0-6-0T No. 30075, LMS ‘Black Five’ No. 45110, Midland Railway ‘half-cab’ 0-6-0T No. 41708, Peckett 0-6-0ST No. 2000 and Hawthorn Leslie 0-4-0ST Henry.